I hope you all had a wonderful Easter! 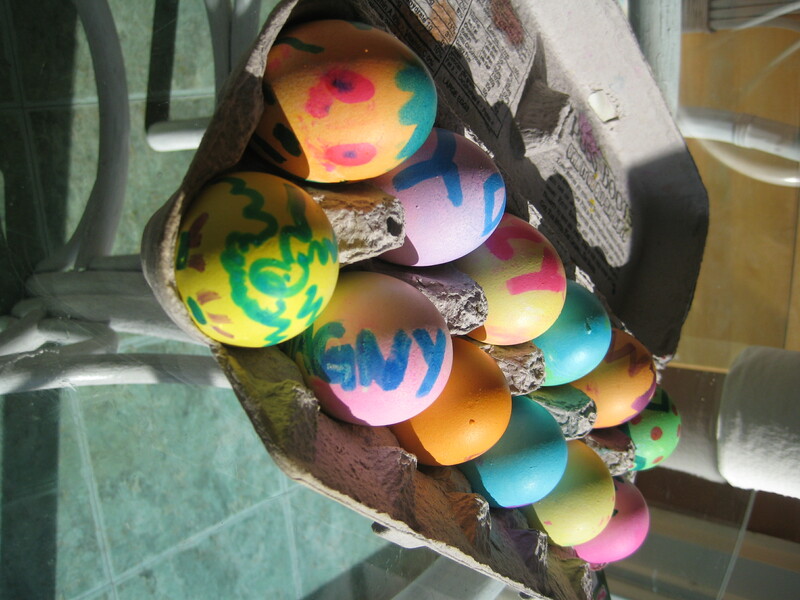 Our weekend was full of coloring eggs then taking turns hiding and hunting them over and over. My oldest daughter got the biggest kick out of playing “hide-and-seek” with the eggs, and eventually I realized the eggs needed to go back into the refrigerator so we switched to plastic eggs. We had about a dozen and a half eggs left over. The remaining half-dozen were either devoted to deviled eggs or are still being steam-cleaned out of the carpet due to some tiny, unmonitored fingers. (Lesson learned. Babies should not be alone with eggs.) 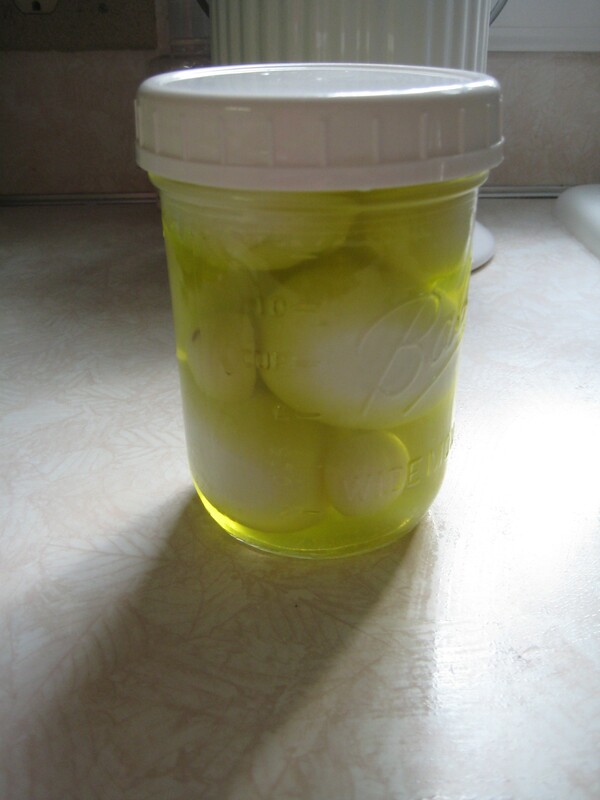 I already knew I wanted to try making pickled eggs with my leftovers and scoured the Internet for good recipes. I narrowed it down to three that I wanted to try. I’ve only ever tried the kind pickled with beet juice – and love them – but I’m curious to try a few other kinds. I actually ended up buying another dozen eggs so I could have enough to do experiments with! One of the tidbits of information I learned whilst looking online for recipes, is that canning eggs is not recommended. There’s mostly arguments against canning them (for fear of botulism), and one fairly determined man out there in favor of canning them who has posted in Canning’s defense on several site forums. I included links below if you are interested in deciding for yourself what to do, but I am choosing to skirt around the issue myself and simply refrigerate them. If they are as tasty as the recipe-creator’s claim to be, then I won’t have to worry about them lasting very long! I am being a little snarky regarding the issue, but truthfully, all the resources above have fairly valid points. I, however, don’t consume enough pickled eggs to enter wholeheartedly into this fierce debate. (Who knew so many people are that passionate about pickled eggs?) 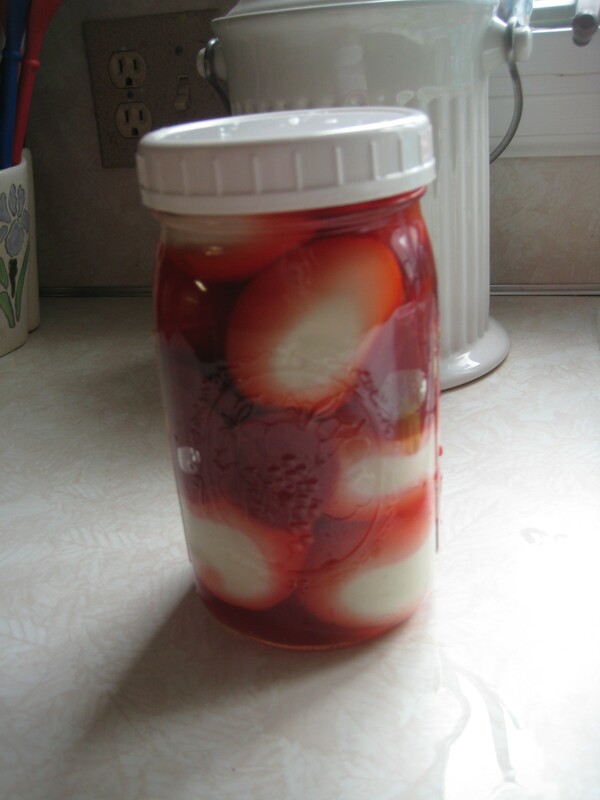 Therefore, the top link will direct those of you interested in canning pickled eggs to a blog that will give you detailed directions in doing so. These recipes are for refrigeration only. If you don’t already have hard-boiled eggs, the first step you need to do is get some! 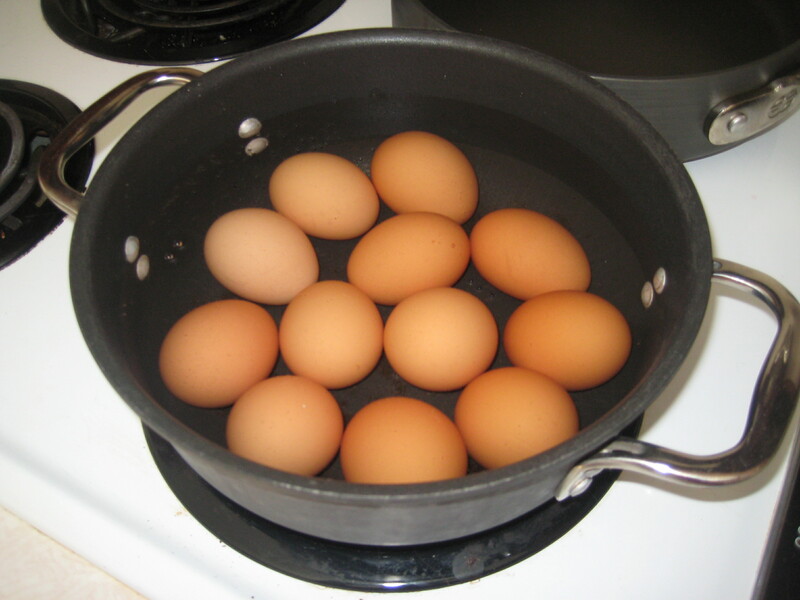 My mother’s tried-and-true method for boiling fresh eggs is to put them in a pot, fill it with water, put the burner on high. When the water begins to boil, set a timer for 9 minutes. When the timer goes off, drain the hot water from the pan and rinse the eggs for a few minutes under cold water, then put them back in the fridge. 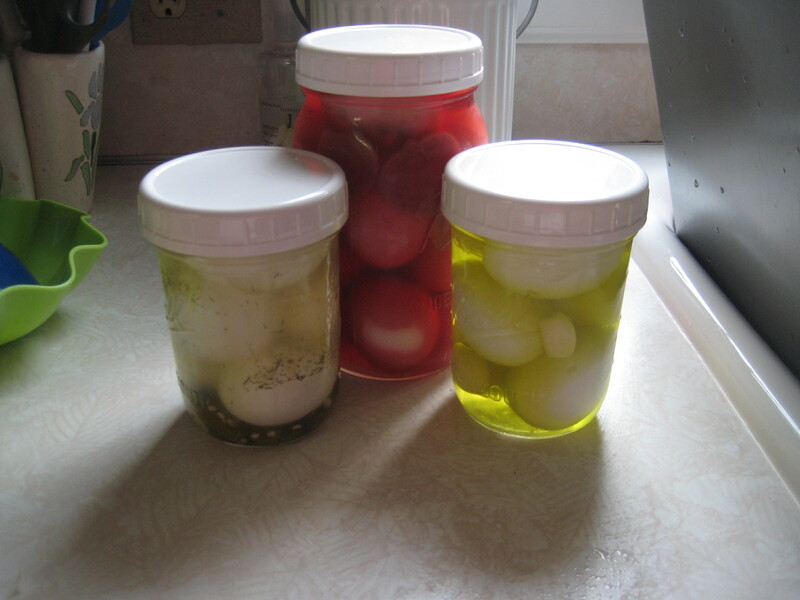 Once you have some hard-boiled eggs, you can make pickled eggs! These three recipes are the ones I tried, and spent less than 30 minutes making all three kinds. Also, as you will note from my pictures, you can get a plastic, reusable lid for your canning jars! These are really cool, and can be used in the freezer as well. 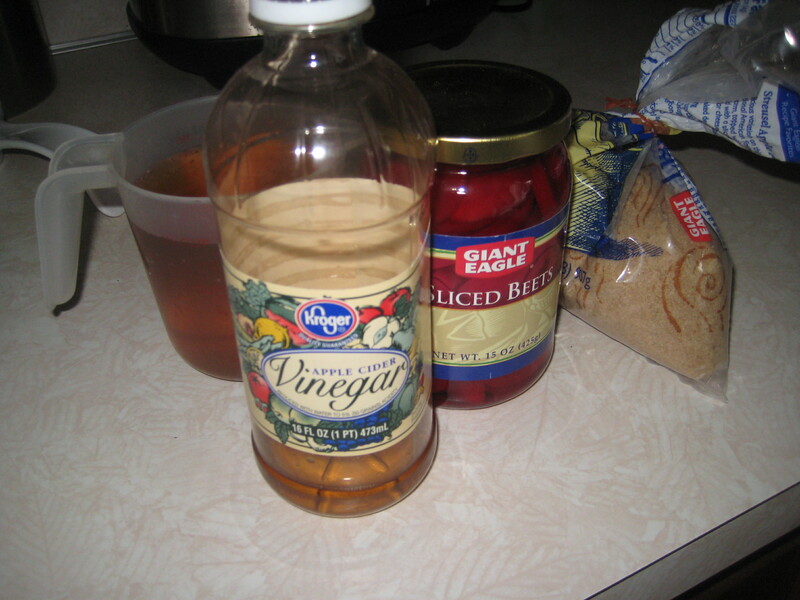 (They obviously can NOT be used for canning though…don’t try it!) You can also write on the top with a dry-erase marker. I recommend using wide-mouth jars for pickling eggs for ease of reaching in to snag one, or any glass jar with a lid that seals tight. Combine all ingredients except eggs and bring to a boil. Boil 3-4 minutes and remove from heat. 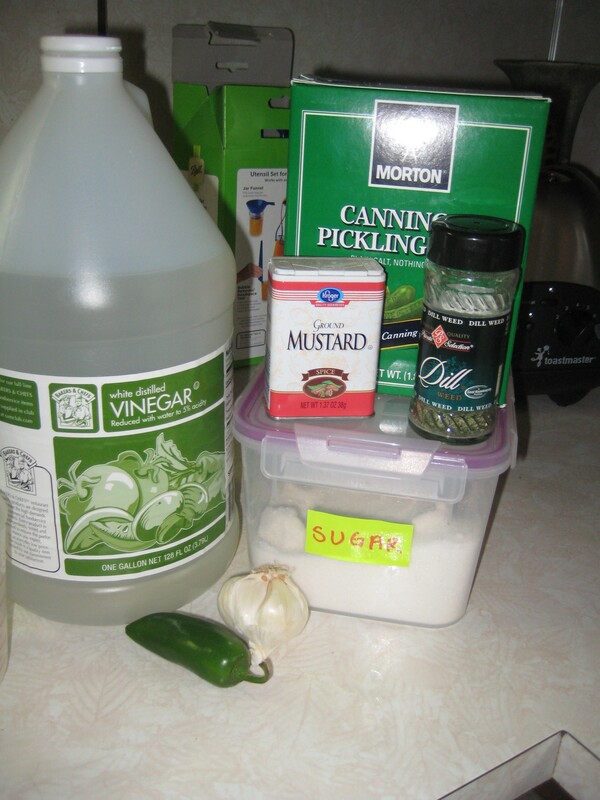 Strain the pepper and garlic from the brine and place in the bottom of quart jar. Pack peeled eggs on top of the pepper and garlic slices, stir the brine well and pour hot brine over the eggs until they are completely covered. Place lid tightly on jar and shake. Refrigerate 1-10 days before eating, occasionally shaking the jar to keep the brine from settling. I cut that entire recipe in half and just used 6 eggs so I could store them in a pint jar. Bring all the ingredients except the eggs to a boil, reduce the heat and simmer for 5 minutes. Pack one dozen peeled, hard-cooked eggs into a quart-sized jar. (I ended up with only 11 eggs because my pint-sized helped peeled an egg and immediately consumed it. It turned out serendipitous though, because I don’t think the 12th egg would have fit in there anyway…) Pour the hot brine over the eggs in the jar, cover, and refrigerate immediately. Note: In classic Chelsea style, I learned belatedly that these are better packed loosely. See the white part? It would be prettier and better tasting if the entire eggs made contact with the brine. I saw this one in a comment section on a forum, too. I thought, “Hey…I LOVE pickles, I ALWAYS have leftover pickle juice!” Another commenter said she uses her leftover pickle juice for pickling fresh veggies, too. Someone else said they like to throw some garlic cloves in there, and since I am never one to turn down garlic, I did that also. 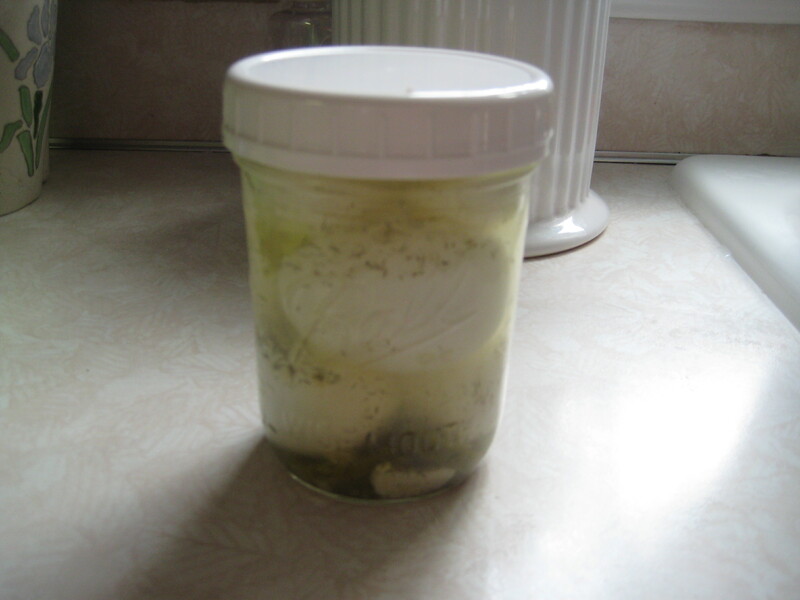 Someone else advised bringing your pickle juice to a boil to kill off any bacteria left from dirty hands that may have reached in to get pickles. Guilty of this every single time I obtain a pickle (or 2, or 5), I agree. 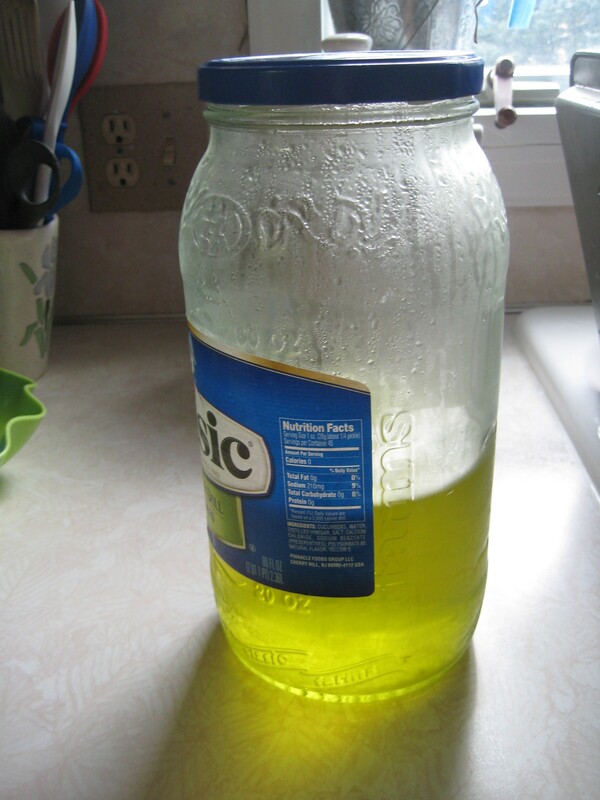 SO, once you eat your last pickle, bring the juice to a boil for 3-4 minutes then pour over peeled eggs in a jar. (You can even reuse the pickle jar if you want!) If you like blasting people with garlic breath as much as I do, add a few freshly peeled cloves to your jar, too! Here’s a bonus recipe for you! I didn’t make this one, but I saw it on a forum and thought it looked pretty good! I didn’t have any sherry in the house and didn’t want to run to the liquor store. Next time I come across a recipe that uses sherry, I’ll remember to make these eggs! I actually don’t have a verdict yet. All these recipes say to let the eggs “marinate” for several days before eating them. I just made these yesterday, so I haven’t tried any yet. (Well, ok, I confess I did pull one of the beet eggs out to “test” it. It was pretty good, but I am going to wait another day or two before trying another one.) I will let you know which recipe I like best in a few days! ****UPDATE******** We have a verdict! Click HERE!